Need something easy and fast to make? These simply beautiful, crocheted carnations will last forever, as a gift to your loved ones or a decoration for your table. There’s nothing like a bundle of crocheted flowers to brighten someone’s day! Just follow the simple crochet flower pattern below. With yarn needle, weave yarn into the top of round 2 (bottom of round 3), pull yarn tightly, bunching the flower together. Tie off and shape flower. 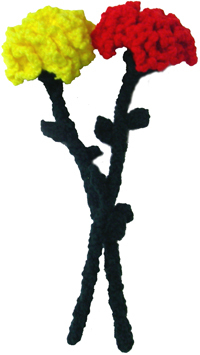 With yarn needle, sew stem onto bottom of flower using photo as a guide. With yarn needle, sew leaves to stem as desired. Optional: insert wire into the stem of the flower and shape as desired. Do you need help with this crochet pattern? Leave a comment! This entry was posted on Tuesday, February 10th, 2009 at 11:44 AM by Rachel Choi	and is filed under Free Crochet Patterns. You can follow any responses to this entry through the RSS 2.0 feed. You can leave a response, or trackback from your own site. Thank you, thank you, thank you for this pattern. I must try it…and it looks so easy to follow! You are such a talented designer, and I can’t wait to see what you make next. Thanks so much for the compliments, let me know how the flowers come along! You do such wonderful work. I don’t know when (if ever) I have seen such beautiful crochet flowers. I will be make the rose and the carnations. Whew! It took me a while to finish this but it was so worth the time. It is beautiful. I made a white one. Thanks so much for posting this pattern. I will be making more, and the rose, too. It took me a while the first time too!! Probably because of all of those rounds. I’m so glad that you made it! Thanks for all of your wonderful comments. While these are truly beautiful… I wonder if anyone has a link for Roses? Hi Rachel I am new to your website and I saw this pretty pattern. I am a little confused as to how to weave yarn threw round 2 and 3 and bunch together. Hi Tricia, try and look for the top of round 2, then use a yarn needle to weave yarn through each stitch. When you pull the yarn tight, it’ll bunch the flower together. There’s no exact way to do it, so try it out and see what works for you. Hey! I made the carnation with no problem at all, and it turned out beautifully! But, I am actually having trouble working out the stem part. I get as far as the slip stitch, and when I start double crochet stitches, the whole thing turns into a mess! I can’t seem to keep track of where I’m supposed to be putting the crochet hook. Any tips? Hi Ann, I used a really small hook and crocheted pretty tight. Try to check the gauge if you want to crochet with the same tension that I did. If you are crocheting looser, than your flower will turn out bigger. You can also alter the pattern, by crocheting less rounds if you’d like. I just finished making one of these (without the stem, so far) and it was so easy. It came out great! Thanks for the easy pattern; can’t wait to make more. Great!…….such varied things of crochet and I keep learning.Tks for all you put up as I love to try a lot of items on your site.Wish I could get all those super yarns too. Fifteen days until my yarn buddy gets married, and I had volunteered to crochet her bouquets and boutonierres. I needed one more pattern, am running out of time to write one, and I stumbled upon this just tonight. Should be about perfect! Thank you so much for sharing! What gauge wire do you recommend for the stems? I don’t want the flower drooping over in the vase! Would 16 gauge be about right? Hi Emma! I used 17 gauge wire for mine, 16 should work too. Many thanks! I haven’t seen 17 gauge at Amazon yet…but did find the 16 gauge, and I suppose it’ll be even a tad thicker. Appreciate the quick reply!